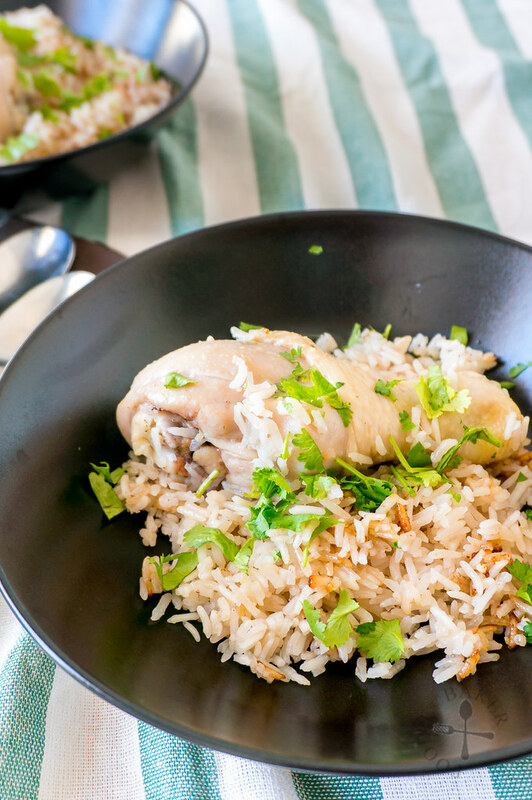 Chicken rice has always been one of my favourite food – and after moving away from Singapore, it’s only natural that I crave for the oily and fragrant rice topped with silky and juicy chicken meat! But as there’s only X and me, it’s a little ridiculous to cook up one whole chicken as we won’t be able to finish it in one sitting. I then remembered my mom tried cooking chicken rice in a rice cooker before – her rice cooker had a steamer insert, so she placed the seasoned rice in the rice cooker, add in the steamer insert, place the chicken in the steamer and cooked as per normal, so even though my rice cooker is very basic with no additional gadgets, I decided to give this method a go. My mom used small, chopped up chicken pieces, but I decided to use chicken drumsticks as it’s easier to portion and eat, and it’s an extremely juicy and moist part. After exfoliating the chicken with salt, I remembered my mom, in another recipe, rubbed salt on chicken pieces and set aside for a while before steaming them. This made the chicken moist, tender and flavourful. So I decided to do the same, but I rinsed off the salt before adding the chicken drumsticks into the rice as I didn’t want to over salt the rice. The rice uses the same seasoning as my chicken rice recipe, except onion is added this time round. My rice cooker is extremely basic with only “cook” and “keep warm” functions and have no other funny gadgets, so I simply pushed down the chicken drumsticks into the rice. To make sure that the chicken is cooked thoroughly, after the rice cooker switched to the “keep warm” mode, I left it for 15 minutes before turning off the power and left it for another 15 minutes before serving, which was sufficient to cook the chicken. The chicken is tender, moist and juicy with a slight hint of saltiness. The skin, after being exfoliated vigorously, is smooth and gelatinous. 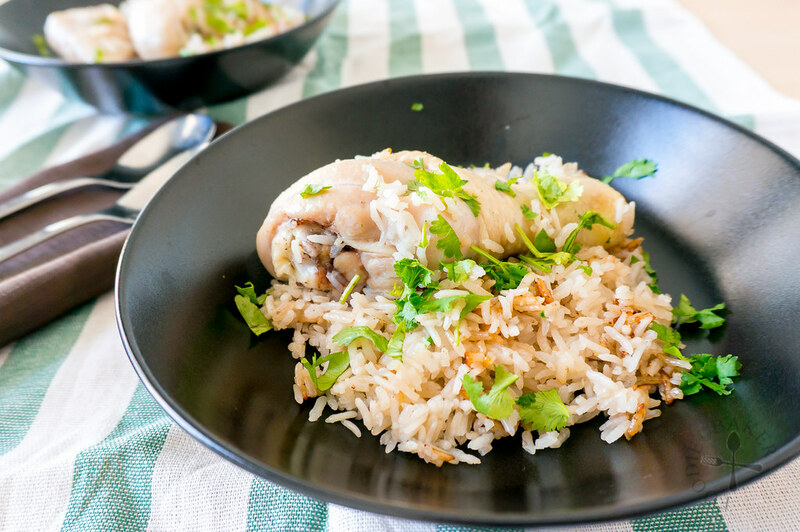 The chicken fats melted into the rice mixture, and with the onion, garlic, ginger and other condiments, make the rice sweet, flavourful and with just the right amount of oiliness. The onion is a new addition and I think it made a huge difference in the taste so I’ve edited the original chicken rice recipe too. I cannot believe that I managed to succeed in one try and the only regret is that I don’t have a soup and the chili to go with it! 1) Rub the chicken skin with plenty of coarse salt. Rinse, rub in fine sea salt and let stand for 30 minutes to marinate. Rinse off the salt and drain. I used 5 drumsticks as I had extra, but 4 is sufficient for 4 people. 2) Blend onion, garlic and ginger together. Heat oil in a frying pan and add in the blended ingredients. Stir-fry until the mixture is fragrant. 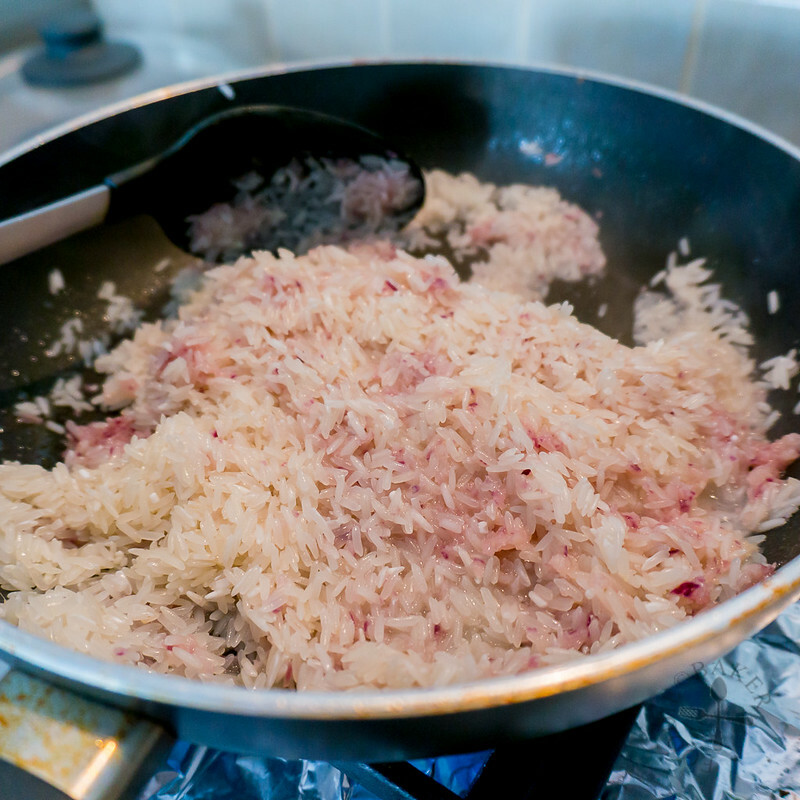 3) Add in the rice and stir to coat the rice with the mixture. 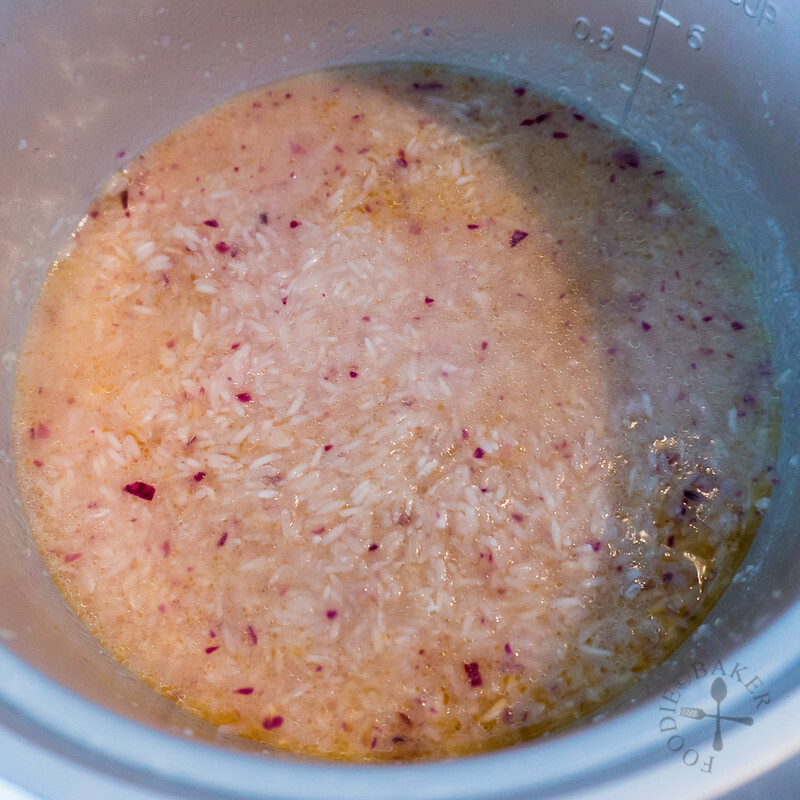 4) Transfer the rice into a rice cooker pot. Add in chicken or vegetable stock until the stipulated line. Add in the seasoning. 5) Place the chicken, skin side down, on top of the rice, pressing it down slightly (don't have to fully submerge the chicken). Cook as you would cook normal white rice. After the rice is cooked, keep warm for 15 minutes, then turn off the power and let stand for another 15 minutes. Give it a quick stir to mix everything up, then it’s time to serve! 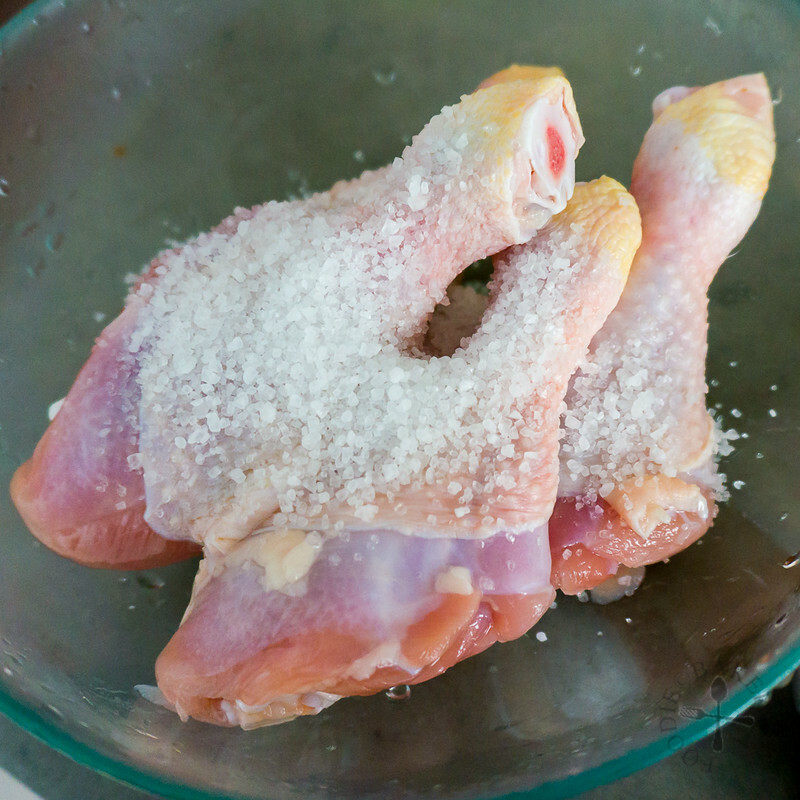 Rub the chicken drumsticks generously and thoroughly with coarse salt to exfoliate the skin. Rinse off the coarse salt and drain the chicken. Rub in 1 teaspoon fine sea salt and set aside for 30 minutes. Rinse the chicken, drain well and set aside. 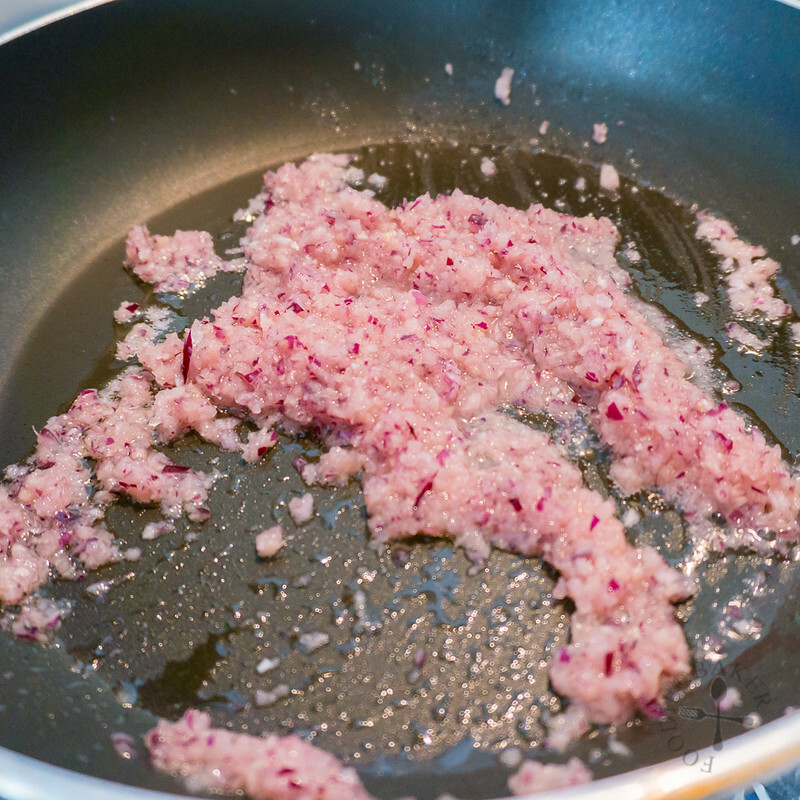 Blend onion, garlic and ginger together into a paste with a food processor. Alternatively, grate the garlic and ginger and mince the onion finely with a knife. Heat oil in a frying pan over medium-high heat. Add in onion mixture and stir-fry for a few minutes until fragrant. Add in rice and stir-fry for a minute until the rice grains are coated in oil. Transfer the rice to a rice cooker. Add in enough stock to cook the rice (follow the instructions of your rice cooker), light soy sauce, sesame oil and remaining ¼ teaspoon salt. 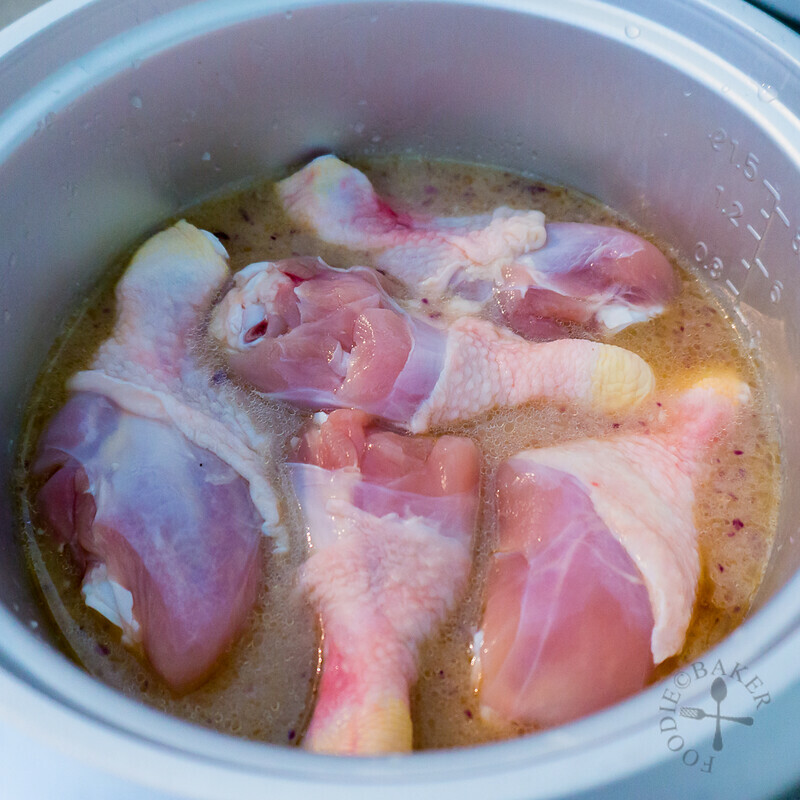 Add in the chicken drumsticks in one layer, skin side down. Press it down slightly into the rice (they don't have to be submerged completely). Cook the rice as per normal. After the rice cooker has "jumped" and switched to "keep warm" mode, keep warm for 15 minutes, then turn the power off and let stand for another 15 minutes. 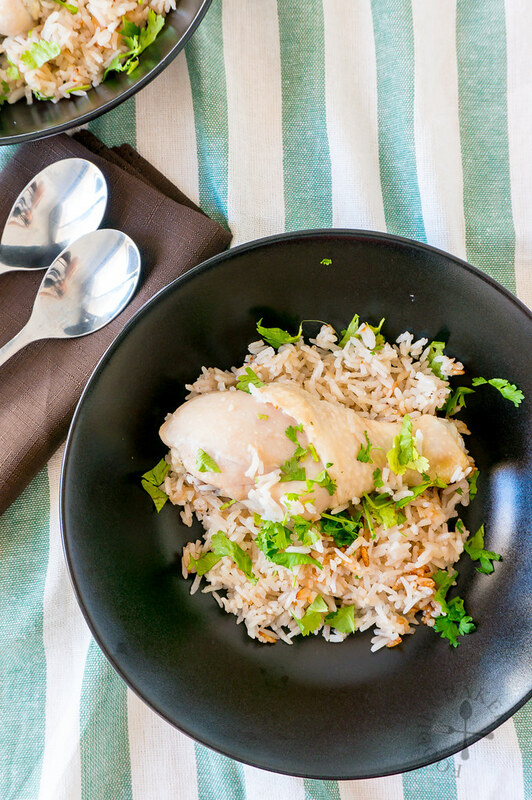 Stir to mix the rice, then spoon into a serving plate with the chicken drumsticks. Garnish with coriander and serve with cucumber. - Boneless chicken thighs can be used in place of the chicken drumsticks. - The vegetable stock I used was made by boiling potatoes and carrots with a little salt (when I was making mashed potatoes). If you use salted canned stock, omit the ¼ teaspoon salt for the rice. You can use stock cubes too, just dissolve the stock cubes in the water first before using. Similarly, if it's already salty, omit the salt. - You can also add a few pandan leaves if you have them on hand. - Do switch off the rice cooker after it had keep warmed for 15 minutes as the onion may burn at the bottom. Hi! Thank you for sharing this easy to follow and delicious recipe!! Just made it for lunch today. Fragrant aroma all over the kitchen while rice cooker was steaming. When the ‘cook’ setting clicked off, everything looked like a thick porridge. But after 15min on keep warm, and 15 min let stand covered, it came out perfect! My rice was a bit too soft because I added more water since I used brown rice, can adjust next time. Thanks again! Hi Drei! 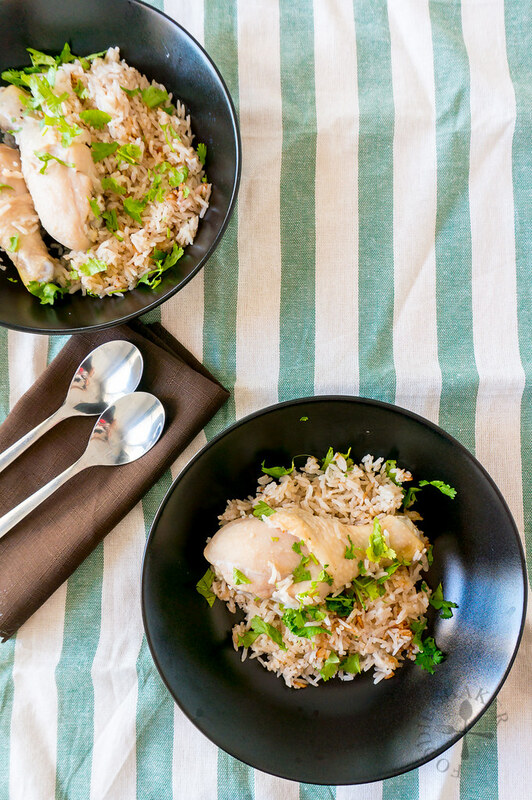 Glad you like this recipe, making it with brown rice sounds yummy! Hi Almira, thank you for trying and I’m so glad it turned out delicious for you! I tried your recipe. However, both the chicken and rice were still kind of raw when its done. What rice cooker did you use? Or should I just press cook again? Hi Grace, oh no sorry to hear about your problem with this recipe. I used the simplest rice cooker which only has “cook” and “keep warm” functions. How many servings did you make with this recipe? Is your rice cooker very full when you put everything in? I’m guessing this may be why the chicken and rice were still raw. I’m really sorry I cannot help troubleshoot this recipe much. Can you please share what did you do in the end? I will try out this recipe again and hopefully we can solve this problem! This rice and chicken , it looks so amazing ! thanks for sharing with us! One pot is totally music to my ears! I’ve made other chicken in the rice cooker and it’s great how well it cooks it all and the flavour infuses into the rice. The one I used also had just a cook and keep warm setting and it worked a treat. Great idea doing chicken rice in it! Oh I love one pot meals. This sounds and looks fantastic. I don’t have a rice cooker but my guess is that this is easily adaptable. Delicious recipe. Thanks so much Jaslin 🙂 Will try this out for sure , thanks for your reply. I can’t remember when I last time had some hainanese chicken. I love your one pot method and it surely looks delicious, Jasline.